However, night photography will not be allowed during the safari. 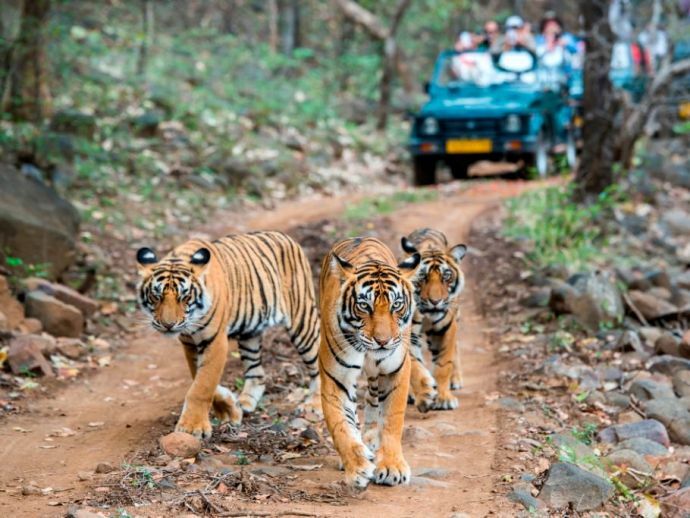 Following the footsteps of Melghat and Pench Tiger Reserve, the Tadoba-Andhari Tiger Reserve (TATR) has now decided to commence open night safari in the buffer zone of the reserve. The safari will begin from the February 1. The night safari will span on a stretch of 25kms. It will start from Padmapur and will extend up till Kondegaon gate, which is in the outskirts of Mohurli. The whole section is a forested tar road and is replete with wild animals. The locals and villagers in the vicinity of Mohurli use the stretch for travelling purposes. “Now such elements will have to pay Rs 2,000 towards entry fee and Rs500 for guide. A ride in Gypsy will cost Rs1,500 from 7pm to 10pm. Locals and those having online bookings in Tadoba will be allowed to go free,” said Guruprasad. Various banners have been put up by the Agarzari eco-development committee (EDC) which promotes the safari under the pretense of “Patrolling Tadoba by night”.